March 26, 2012 - GS Yuasa Corporation (Tokyo Stock Exchange: 6674) announced today that its industrial-use lithium-ion battery module has been installed in Japan Freight Railway Company’s (“JR Freight”) first mass-produced hybrid shunting locomotive, which was launched from the Tokyo Freight Terminal Station in February 2012. Prior to mass production, JR Freight tested GS Yuasa’s lithium-ion battery modules in a prototype locomotive (model HD300-901) from April 2010 under various operating conditions to verify its environmental performance and other capabilities. The performance of the GS Yuasa lithium-ion battery modules was highly rated, and as a result JR Freight decided to install the modules in its first mass-produced locomotive (HD300-1). The power for the hybrid shunting locomotive is provided through a system that combines a small diesel engine generator with high-capacity lithium-ion batteries. These batteries provide a crucial support function as they store regenerative braking energy and use the energy to power the diesel engine during start-up acceleration and at other times. Compared to conventional diesel locomotives (DE-10), this system reduces nitrogen oxide (NOx) emissions by 61%, fuel consumption by 36%, and noise levels by 22db. 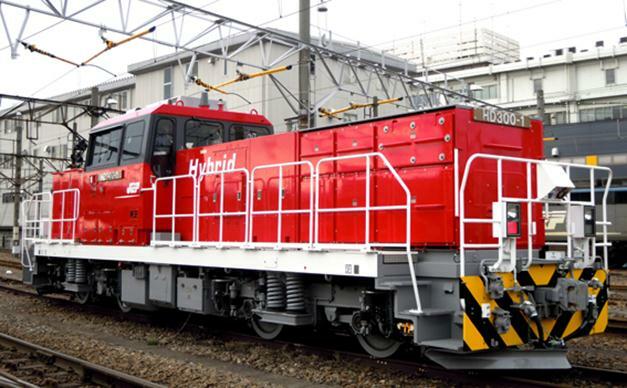 Currently, many of Japan’s railway operators are conducting field tests on new hybrid railway vehicles which equip railway vehicles with storage batteries. GS Yuasa is providing lithium-ion batteries for these railway vehicles and expects wider adoption of the batteries in the future as mass-produced railway vehicles commence service. 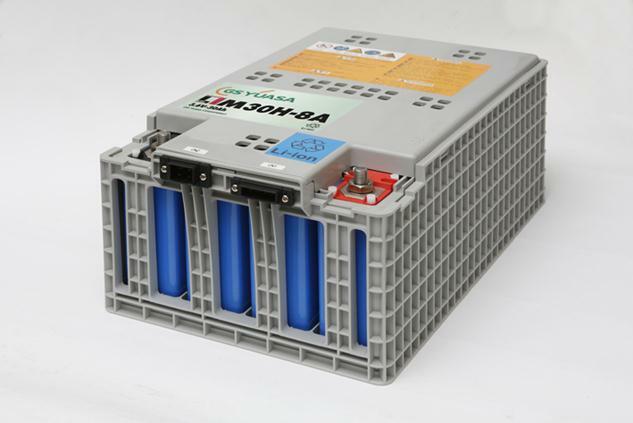 GS Yuasa will strive to expand the adoption of industrial-use lithium-ion battery modules in environmentally friendly railway vehicles in order to further contribute to lowering the environmental burden. The maximum current capacity is 600A and the Direct current capacity is 100A, which ensures stable charge and discharge performance. The use of plastic resins in the outer module casing enables a lightweight, compact design. The plastic resins have superior insulation properties, enabling them to be used even under high voltage conditions. The modules use cooled air, which helps to raise the efficiency of the cooling system. A proven battery-monitoring device for industrial-use lithium-ion batteries is a standard feature. The device continuously monitors the voltage of all cells as well as the module temperature. The device has a function to send battery data to the charging device and the system. By adding a GS Yuasa battery management unit (BMU), battery data can also be output to external devices.